The owners of Breckenridge Grand Vacations are deeply committed to supporting the community of Summit County and are actively involved in the community at every level. In addition to the personal involvement, the owners of Breckenridge Grand Vacations realize they have an obligation to financially support the many nonprofit agencies that make Summit County such a wonderful place to live. To that end, Breckenridge Grand Vacations has established a community giving program designed to make grant and sponsorship funding available to the nonprofit organizations serving the Summit and Park County communities. 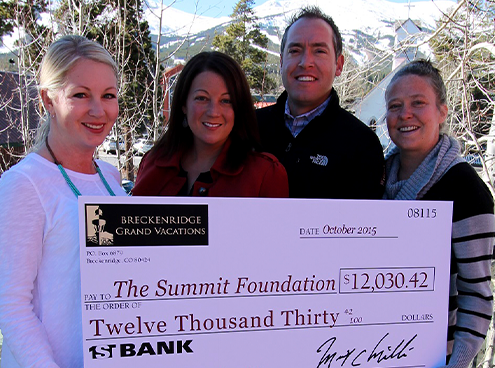 Breckenridge Grand Vacations operates and manages a Donor Advised Fund with The Summit Foundation. Since 2005 the Breckenridge Grand Vacations Donor Advised Fund has donated more than $5 million to local charities and organizations. For more information and to apply for a grant click here.